We want to make sure all of you can join us at the Switzerland for Obama 2012 Election Night Party. Over 150 people have bought their tickets online and we are heading towards a sell-out event. For those of you who don't have a Paypal account or prefer to buy your tickets in cash, volunteers will be around Geneva this week to sell tickets before the October 31st deadline for discount tickets prices. Come by and buy your tickets in cash, find out about volunteering at the party and attending for free, or just stop by to say hi and vent your anxiety about the tight polls! Look for the volunteers with the Switzerland for Obama 2012 Election Night Flyer taped to her laptop and proudly sporting Obama buttons. Let us know if you can't make these times and we'll try to arrange something else to meet you! 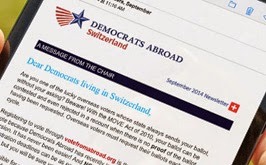 Email election.night@democrats.ch.